Studying scripture is an important part of every Christian’s walk. This Bible reading plan is made in such a way that it will work for just about anyone, no matter where they are at in their journey. The plan is broken up into three different levels. The most entry-level plan is the Essential Plan. As you are reading through, if you find you would like to read more that day, the other plans are listed alongside so you can continue to read more. Each month is broken up into 25 days of reading. Built into each month are catch-up days, or days to study something a little deeper without feeling like you are falling behind. The goal of the plan is to help you feel encouraged about studying the Bible. Just like Hebrews 4:12 says, “For the word of God is alive and active.” We know that as you are reading God’s Word, that it will be alive and active in your life. 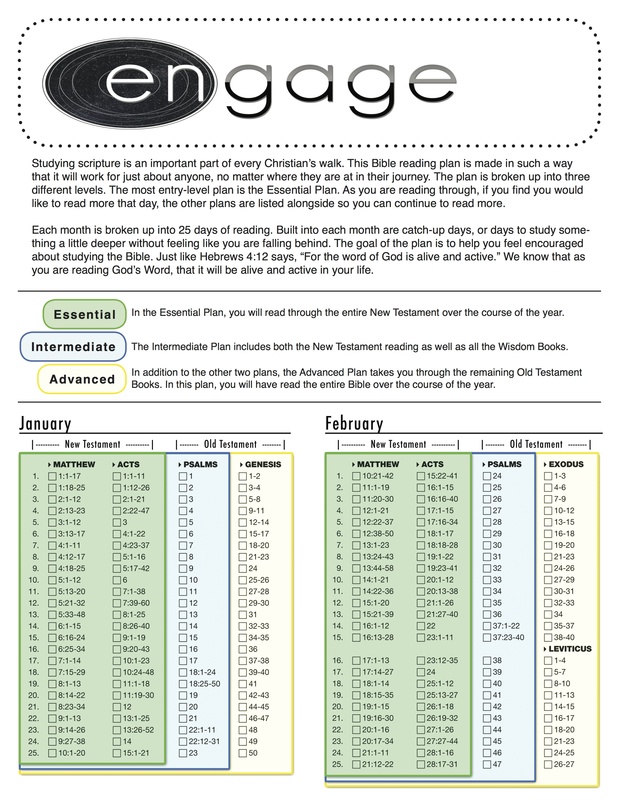 We also have a great weekly podcast called, the Engage Bible Podcast, that follows along with the Engage Bible Reading Plan. Click one of the links below to subscribe to the podcast!